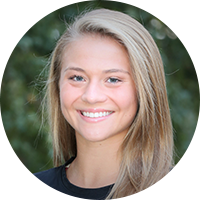 "Challenging myself as a student athlete at Boston College has allowed me to succeed in and out of the classroom. The opportunities and resources made available to me through the University have set me up for both current and future success." Unrestricted gifts are designated to the Flynn Fund and allow the athletics department the flexibility to apply the funds where they’re most needed. These current-use gifts assist with travel expenses, equipment or apparel needs, and they help to fund scholarships not covered by the endowment. Unrestricted giving provides the essential elements needed to recruit and retain student-athletes who can be competitive both on the field as well as in the classroom. Unrestricted gifts are a top priority for the athletics department. The quickest way to grow competitively is to increase our current-use revenue, enabling our coaches to make greater investments in their programs. For example, our women’s basketball team was able to fund an overseas trip to Italy. The trip achieved two important goals: It allowed the team to benefit from extra training days against a new level of competition in preparation for the upcoming season; and it enhanced recruiting as our coaches were able to speak to prospective student-athletes about the unique opportunity to travel overseas as part of their BC Women’s Basketball experience. Unrestricted gifts are designated to the Flynn Fund and give our athletics department the flexibility to apply your support where it’s most needed. These current-use gifts are incredibly valuable because they bolster travel budgets, assist with equipment or apparel needs, and fund much-needed scholarships not covered by endowment. The quickest way for BC to grow competitively is to increase our current-use revenue, enabling our coaches to make greater investments in their programs. For example, our women’s basketball team was able to fund an overseas trip to Italy. The trip allowed the team to benefit from extra training days against strong competition, and it enhanced recruiting because our coaches can reference this unique experience to prospective student-athletes. 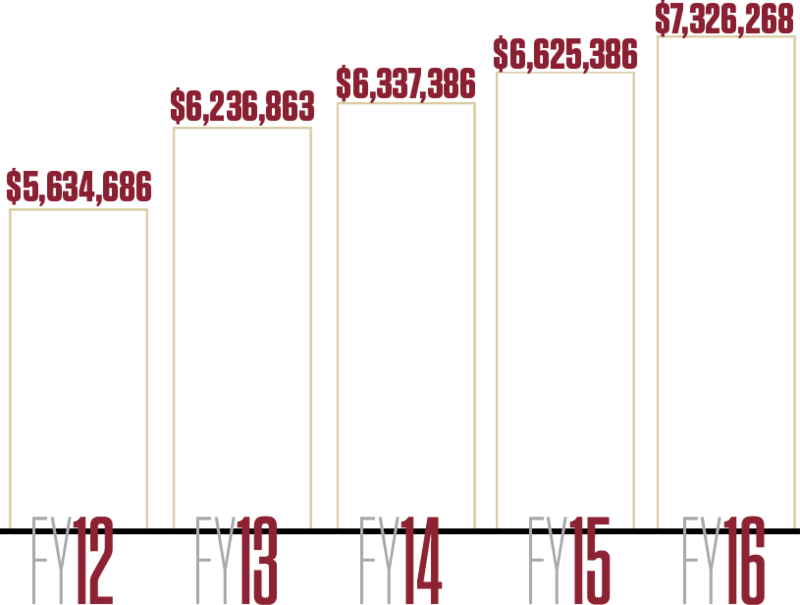 Boston College Athletics has seen steady annual growth in unrestricted revenue due to an increase in the number of Flynn Fund donors, donors who choose to deepen their impact, and programs such as donor-based seating and parking. Our goal is to reach $7.5 million in current-use gifts this fiscal year. We ask our student-athletes to give a little extra to win. Now it’s your chance to provide the support they need to reach their goals. Our Eagles give 110% every day to succeed, putting in the extra effort that excellence requires. They show up early for practice, do extra reps, and scrutinize film in the off-season to prepare for the next opponent. Today, we're asking our donors to give a little extra, too. 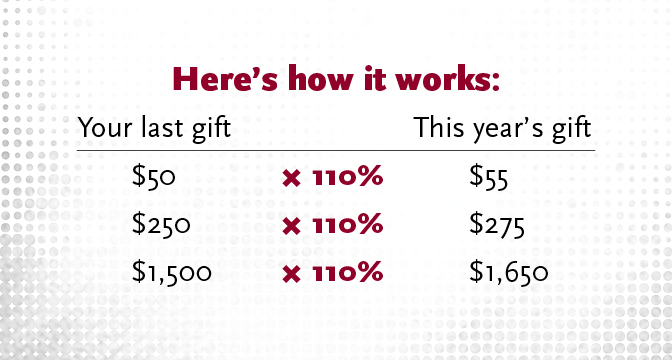 Renew or reactivate your gift to BC Athletics by 110%. New to BC Athletics? You can also participate by making a $110 gift. In lieu of a multi-year commitment for an endowment, one may choose to participate in the Flynn Fund Scholar-Athlete Program. With a gift of $25,000, a donor may fund the scholarship of a single student-athlete in any athletics program for an entire year. The gift provides the University with resources it can use immediately to provide financial-aid to one of our 700+ student-athletes. Endowments provide a way for Boston College Athletics to ensure long-term success of the department by making sure there will be sufficient income to support our student-athletes long into the future. These funds are invested in the University's endowment and a percentage of the return on that investment goes to support the designation of the donors choosing. Special projects for facilities or technology provide unique funding opportunities. Current facility projects are on-going for the Athletic Field House, Baseball/Softball Fields as well as the Recreation Complex. Restricted giving provides the opportunity for a donor to make a contribution directly to a specific varsity sport. Funding provided through this medium is used at the coach’s discretion. Schedule payments over the course of a year or designate a perpetual gift online by utilizing the gift frequency option or call the Flynn Fund at (617) 552-0772. Gifts that consist of donated services or items that would normally be purchased by the Boston College Athletic Department may be honored for tax credit. Examples of Gift-In-Kind donations include food and beverage, athletic equipment, lodging, and transportation. Call the Flynn Fund at (617) 552-0772 for more information. Fidelity Investments, National Financial Services Corp. 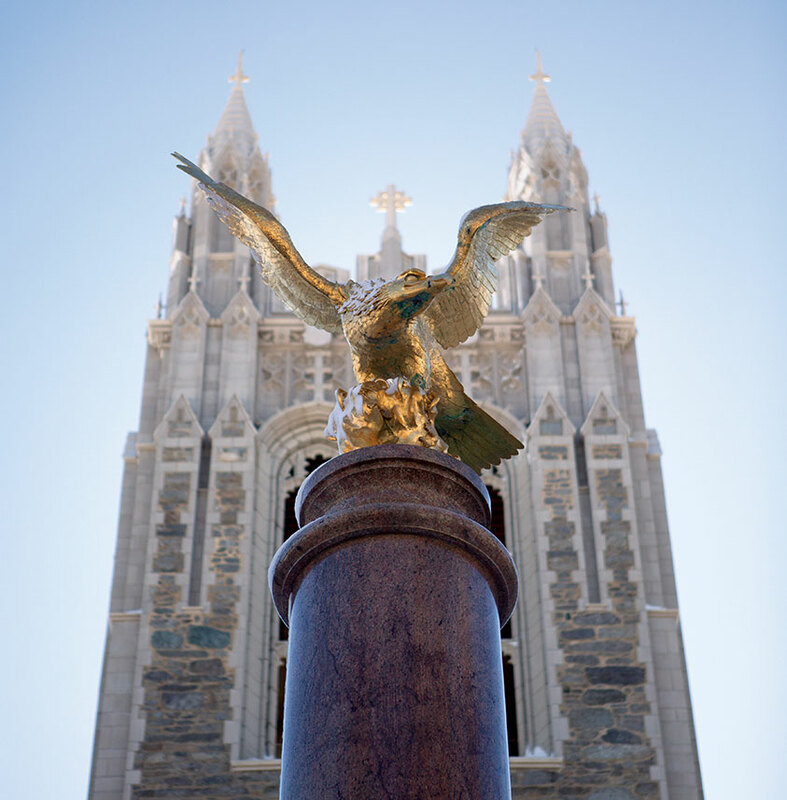 Please call the Boston College Gift Processing Office at 617-552-4844 to let us know the name of the stock and the number of shares that you will be transferring to the BC account at Fidelity. This information will help us to identify your gift and to provide you with proper gift acknowledgment on a timely basis. If you or your spouse are employees of one of the thousands of companies that sponsor matching gift programs, you can DOUBLE the impact of your gift in support of BC student-athletes! We ask that you contact you/your spouse’s human resources department to find out if the company matches to athletics. After making your contribution, notify the employer of your personal gift to Boston College and fill out all proper forms. Finally we ask that you mail the original copy of that matching gift form to us. If your company has an automated or online service, please be sure to notify us and we will provide you with additional instructions. Office of Gift Planning at (877) 304-SHAW. Are gifts to Boston College Athletics tax deductible? Yes, gifts are tax deductible to the extent of the law. For more information please contact your tax advisor. What is Boston College's fiscal year and do I have to pay my pledge off all at once? 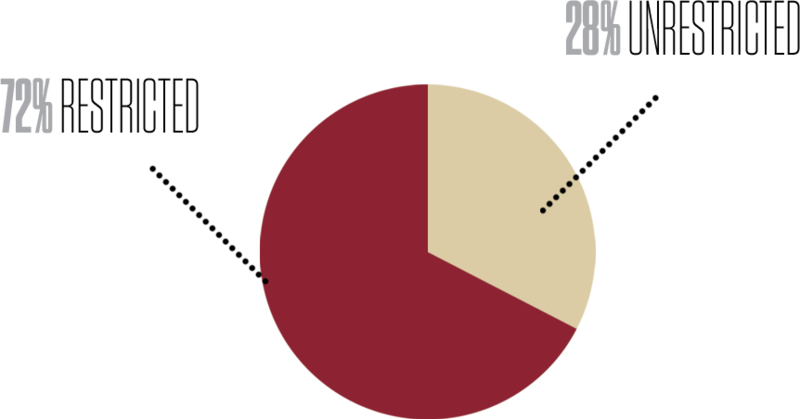 Boston College's fiscal year runs from June 1 to May 31. Gifts can be paid over a period of time throughout the fiscal year. Your donation level for each fiscal year is determined by the amount that is paid by May 31. Will my gift count for my class giving participation? Yes. All gifts are counted toward both University participation and class participation. What is the difference between unrestricted giving to the Flynn Fund and giving to a specific varsity sport? Unrestricted gifts to the Flynn Fund give the Director of Athletics flexibility to use the funds where they are needed the most, whereas a gift to a specific varsity sport directly benefits that particular program. Either way, you are greatly assisting our student-athletes. Can I make a gift of appreciated securities to Boston College? Yes, gifts of highly appreciated securities (i.e., a stock transfer) are very often the most tax efficient way to make a donation to Boston College Athletics. To initiate a securities gift, please download a gift of securities form and contact the Office of Gift and Estate Planning at (617) 552-1085 if you have any further questions. Can I utilize my employer's matching gift program? It is the donor's responsibility to contact their employer's matching gift office and do the following: find out if the company matches to athletics, notify your employer of your personal gift to Boston College, and fill out all proper forms and mail the original copy to us. If your company has an automated or online service, please be sure to notify us and we will provide you with additional instructions. Can I name Boston College Athletics as a beneficiary of my will? Yes. Including BC in your estate plan is a powerful way to create a lasting legacy that will help the next generation of student-athletes excel at sports and in the classroom. You can name BC as the beneficiary of a will, trust, retirement account or life insurance policy or create a charitable gift annuity and designate your gift to the Flynn Fund. To learn more on how to make a legacy gift, contact the Office of Gift Planning at (877) 304-SHAW.